April 27, 2018, 11:00 p.m. In April last year it seemed that the Conservatives were attempting to rebrand their target audience. Where before the Tories talked about those who were “Just About Managing” (or “JAMs”), in a speech on grammar schools the-then education secretary Justine Greening talked instead about “ordinary families”. The following week, Theresa May called the 2017 general election. The Conservative Manifesto would mention “ordinary” people 14 times, and the “just about managing” only twice. We have previously examined which Britons believed they were “just about managing” and were naturally interested in the public’s self-perceptions of ordinariness. So we asked more than 23,000 people whether or not they considered themselves to be “ordinary”. Using YouGov Profiles, which allows us to compare groups against more than 240,000 variables, we can reveal some of the key characteristics that differentiate Britons who consider themselves ordinary from those who don’t. 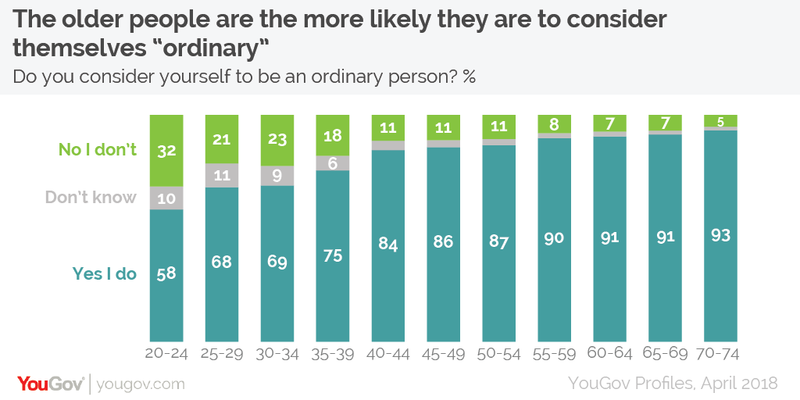 Given the nature of ordinariness, it is perhaps not surprising that the overwhelmingly majority of Brits (80%, in fact) believe they are “ordinary”. By contrast, only 15% do not think they are, while the remaining 5% don’t know. Age is the single most important indicator of self-perceived ordinariness – the older someone is, the more likely they are to consider themselves ordinary. While 58% of 20-24 year olds consider themselves ordinary, this rises across the age groups to as high as 93% among 70-74 year olds. As there is such a strong correlation between age and self-perceived ordinariness, comparing all people who think they are “ordinary” with those who don’t only highlights differences between young and old. For this reason we have split the population into three generations. This allows us to tease out what differences seem specifically tied to perceptions of ordinariness and are not simply a factor of age. The three age groups are: Millennials (covering 18-34 year olds), Generation X (35-54 year olds) and Baby Boomers (55-74 year olds). Within each generation we have then compared those who think they are ordinary with those who don’t. There seems to be a strong connection between family life and perceptions of ordinariness. Across all three generations, people who consider themselves ordinary are more likely to have children than those who do not. (Additionally, ordinary Baby Boomers are substantially more likely to have grandchildren than their not-ordinary peers, at 57% vs 34%). Similarly, across the generations ordinary people are more likely than not-ordinary people to be married. This isn’t simply a case of not-ordinary folk being more likely to be single than ordinary people (although they are): in each generation, not-ordinary people are more likely to agree with the statements “marriage is an outdated institution”, “most marriages end in divorce” and “weddings are a waste of money”. Education is another key indicator – but only for Gen X-ers and Boomers. People from these generations who don’t think they are ordinary are substantially more likely than their ordinary counterparts to have been in their twenties when they finished their full-time education (i.e. went to university). In fact, among Baby Boomers continuing education into their twenties is the second strongest single indicator of whether they are not-ordinary. However, following the greater uptake of higher education in the past two decades, there is no such divide among Millennials. Across all three age groups, women are more likely than men to consider themselves ordinary (69% vs 60% among Millennials, 87% vs 80% amongst Gen X-ers and 93% vs 88% amongst Boomers). Looking at the biggest differences in the way ordinary and not-ordinary Brits describe themselves paints a warm and rosy picture of the former group. 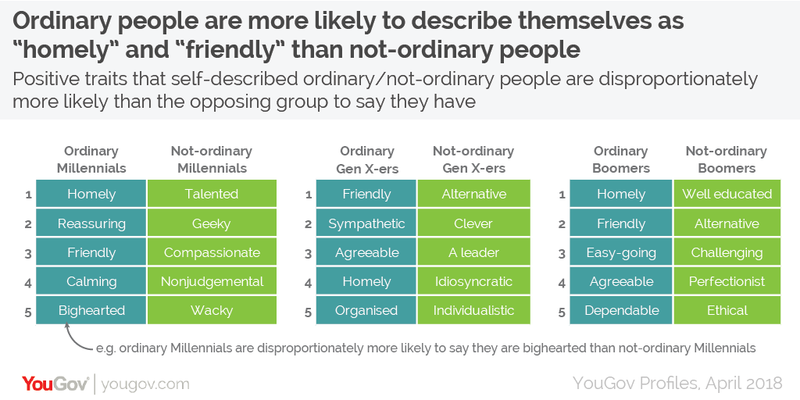 Each of the three generations of ordinary people are statistically more likely to describe themselves as “homely” and “friendly” than their not-ordinary counterparts. Most of the other descriptions used evoked a similar sentiment. Not-ordinary people are more likely to give descriptions that imply nonconformity: “wacky”, “idiosyncratic”, “individualistic” and “alternative”. Impressions of intelligence or capability are also more prevalent: given what we know about their relative education, it may not be surprising that not-ordinary Boomers are most likely to describe themselves as “well educated” compared to their ordinary peers. In terms of their interests, ordinary people across the three generations are consistently more likely to say television (see more below) as well as travel and holidays. Not-ordinary people are more likely to be interested in science and politics. ITV1 – the channel for ordinary Britons? TV habits are also a key differentiator between ordinary and not-ordinary people. Across all three generations, ordinary people are more likely to spend more time watching television, are more likely to get their news from television, and indeed are more likely to say it is their main source of news. In fact, one of the strongest indicators that a Millennial would consider themselves ordinary is that they agree with the statement “I rely on TV to keep me informed”. (Another is that they watch TV between 8pm and 11pm). 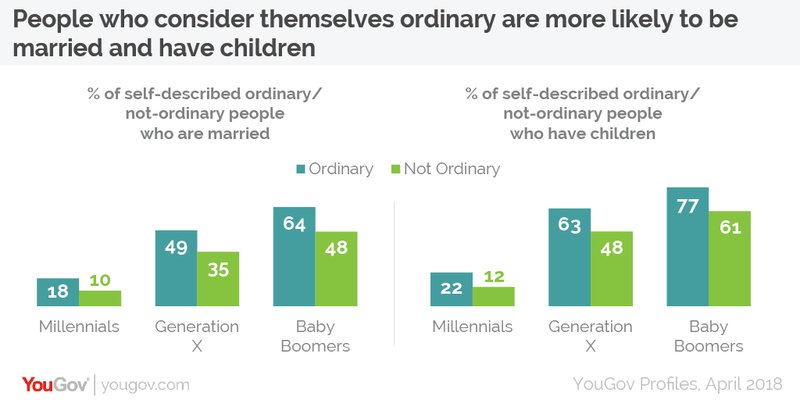 Similarly, among Gen X-ers the single biggest indicator that they consider themselves ordinary is that they watch ITV1 (this is also the fifth strongest indicator among Baby Boomers, and is also an indicator among Millennials). 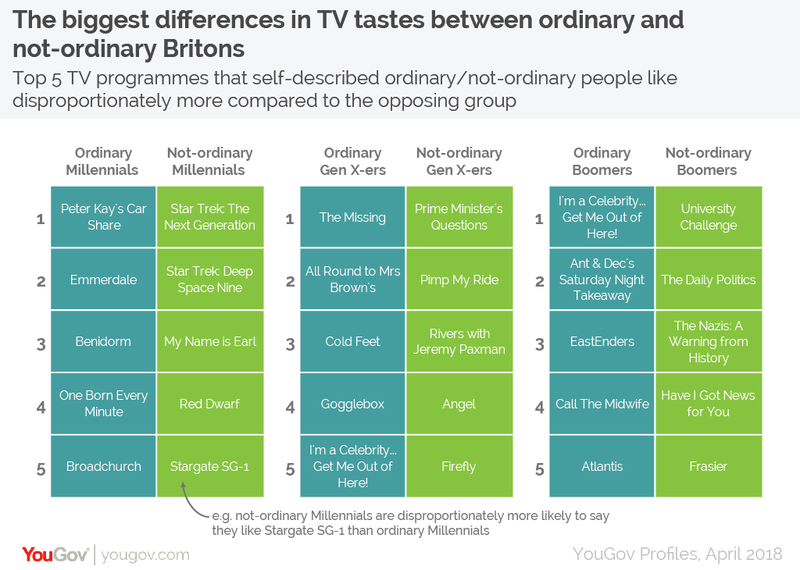 That being the case, it is not surprising to see ITV well represented in the list of shows that ordinary Britons like more than their not-ordinary countrymen. ITV shows Emmerdale, Benidorm and Broadchurch feature in the top 5 shows that ordinary Millennials like more than not-ordinary Millennials, as do Cold Feet and I’m a Celebrity for Ordinary Gen X-ers and I’m a Celebrity (again) and Saturday Night Takeaway among Ordinary Boomers. The results reveal that ordinary people in each generation are more likely to have voted Conservative in 2017 than their non-ordinary counterparts (although in each instance the Conservatives still receive fewer votes than Labour, with the exception being ordinary Boomers, who form by far the most populous voting group). Among Millennials and Gen X-ers, self-described ordinary people are seven percentage points more likely to vote Conservative than not-ordinary people (31% vs 24% among Millennials and 39% vs 32% among Gen X-ers). Among Boomers the gap is twice as large, with 51% of ordinary voters backing the Tories compared to 35% of not-ordinary voters. Trends among EU referendum voters are less clear. Ordinary Boomers are significantly more likely to have voted Leave than their not-ordinary counterparts (63% vs 50%), while among Millennials this difference was 39% vs 33%. 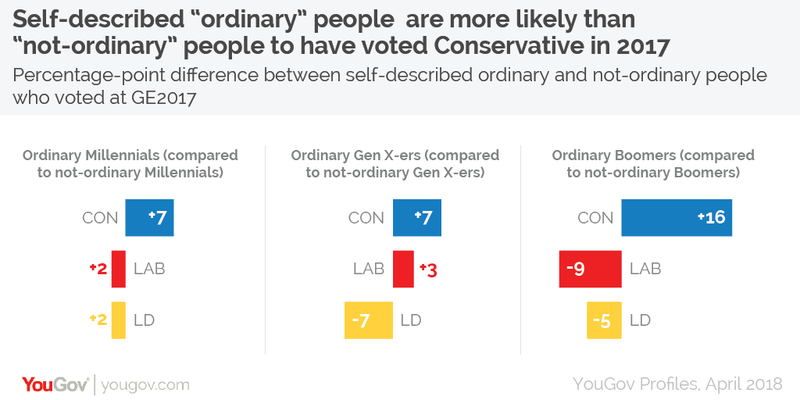 Among Gen X-ers, however, there is essentially no difference between the way ordinary and not-ordinary voters cast their ballot, and the Remain/Leave divide among this generation mirrors the referendum result.